Some chill out music on (Karima Francis – The Remedy….in case you’re interested) and I prepped my ingredients ala Saturday Morning Kitchen (or Blue Peter if you’re of a certain age) see below….. A fairly therapeutic exercise, although i’m not sure it should take the 1 1/2 hours it actually took!! 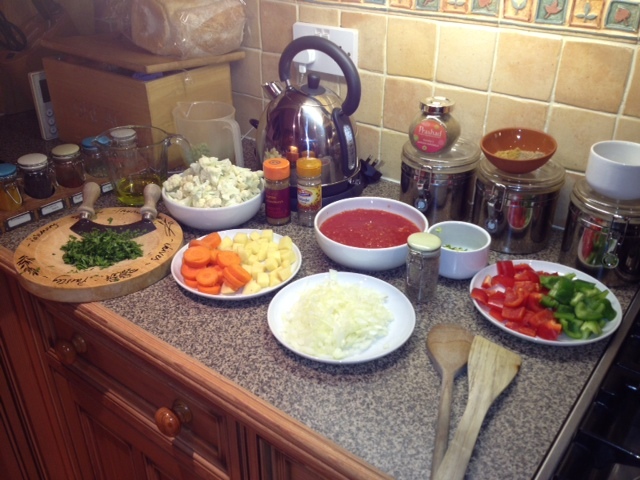 Onto the cooking. A handi, I am reliably informed is a round, deep, thick-bottomed cooking pot, so why the wonderful wife said use a wok, I have yet to work out. The great thing about this particular dish is that after the prep, it all goes into the single handi (or wok….in my case) and there’s no multi tasking involved…phew. I caramelised onions after I had browned cumin seeds in oil. After this, I stirred in blended tomatoes, potato, carrot, some water (well 300ml to be precise) and left to simmer for 7-8 mins (why are these recipes so vague). I then added the now familiar masala paste (which I just adore – green chillies, garlic, root ginger & salt), turmeric, ground coriander, ground cumin and fresh coriander. 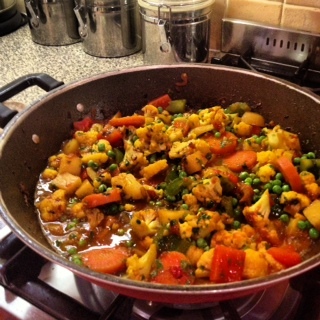 I stirred in red & green peppers, cauliflower and a bit more water (well 100ml exactly) and allowed some more simmering time……or as I have interpreted it….beer time The final element is to stir in the peas and after the cooking is complete stir in (Prashad) garam masala and leave to rest for 15 mins to allow the flavours to develop. 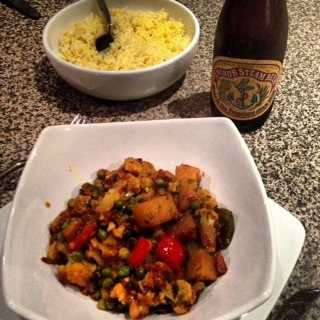 Having tasted the curry both during cooking and after resting, I can report they really do…who’d have thought. The final result, by following the recipe and having everything properly prepped, was without doubt my biggest success to date and not by coincidence the tastiest curry I have made and eaten.